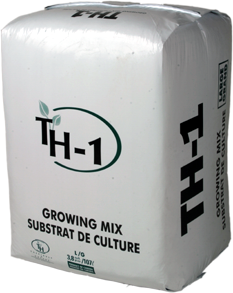 TH-1 All-Purpose Professional Growing Mix | Theriault & Hachey Peat Moss Ltd.
An all purpose professional growing mix ideal for a wide variety of plants. It contains extra coarse grade sphagnum peat moss (81.25%), coarse perlite (13.75%), coarse vermiculite (5%), calcitic lime, dolomitic lime, wetting agent and starter fertilizer with trace elements. It is most useful for.